Wairere falls campsite to Kauritatahi Hut. As I got up for my early morning pee I looked around the clearing at the encroaching Rimu forest. During the night as I’d done the same thing several pairs of glowing red eyes had looked back at me. As dawn broke a couple of fat Kereru almost fell from their perches high up in the same trees down to the berry trees below. It was breakfast time. We cooked up our usual stewed coffee and mixed our choco-rice-bubble-muesli blend with milk powder and water from the stream. As I sat looking out across the same clearing it dawned on me. ‘I’m not really an outdoor person,’ I said to Fiona. ‘Why?’ was the slightly bewildered reply. I didn’t really have an answer. Perhaps I was just trying to say I wasn’t Bear Grylls or something. Perhaps I just don’t like tents. ‘It’s going to take us nine and a half hours to get to the next Hut. It’s eight o’clock now…what time will we finish?’ Asked Fiona rhetorically. It was some sort of test. ‘Just checking,’ she said, obviously worried about my commitment to the cause. The track we walked through was quite different to the previous day’s. There was a lot less water and the forest was brighter. Large areas of regenerating rimu and nikau palms made for some much needed variety. The copper-coloured creeks became rock and boulder strewn mountain streams. It was warm forest, quite unlike any of the forests we’d walked through since leaving Wellington. Kereru seemed to swoop off trees everywhere. The occasional Robin or fantail kept us entertained. After lunch we stopped for a swim in what would be the last river of our day. There was still a touch of summer around the place. As we walked into the afternoon the forest darkened and the day cooled. We wound our way slowly up through gloomy and seemingly neverending bush. Vines made the going tricky in places and the nine and a half hours started to look difficult. An hour from the crossroad that would take us to our hut for the night we were exhausted and feeling like the day would never end. Fiona got out the GPS and we plotted our progress. Solution: Keep going and stop worrying about it. At the cross road the sign told us that the one and a half kilometres to the hut would take us one and a half hours. I had nothing left but Fiona had the GPS. As we staggered up the boggy hill she counted down the metres. Mountain tops are usually dry places. Not on the Kaimai. 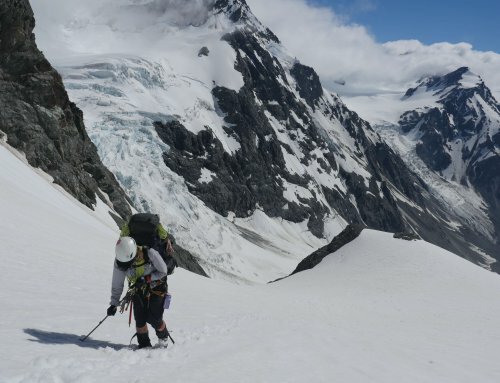 The track on the tops to Kauritatahi Hut should only be walked by masochists and…um…masochists. The bog is endless, thick and deep. At the end of our long day it nearly finished us off. A bush kilometre is nothing like a road kilometre. Maps show routes but never show roots. Mud, steep steps, boulders and cliff faces make map grid lines irrelevant. Every time Fiona called out a distance-to-travel it was always about half of what I estimated. Every mark seemed like the start of a whole new tramp. 800 metres didn’t seem any different to 500 metres…to 300 metres…to 100 metres. The number was always a fresh start. Another impossible goal to reach. Even the ‘Hut 1 Minute’ sign seemed impossibly far away. But…the hut is a three and a half bunk sweety. Its lack of insulation is masked somewhat by its bright red interior. It, and four other similar old hunting huts, have survived recent threats to remove them and are now being looked after by deerstalkers and other volunteers. They’re not nearly as flash as the DoC-sponsored ‘hunting lodges’ we’d stayed in while we walked the Kaweka but they are there all the same. Kauritatahi Hut was our shelter from the mud. It had mattresses, bunks, a dry floor and standing room. I may not be an outdoor person…but give me a hut with a view like the one over Katikati we had that night and I’m in heaven. Phew.